Mumm Napa, established in California in the late 1970’s has been following traditional wine making techniques of its French heritage to create the finest sparkling wines. It is for that reason that Mumm Napa is a favorite spot of locals and tourists. 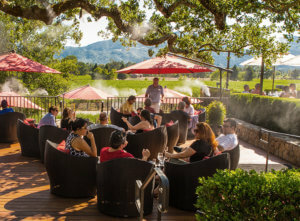 But perhaps one of the contributing reasons for their continued popularity during the summer (besides a great selection of sparkling and still wines) is a tasting room complemented by a scenic outdoor patio that is kept cool by a Koolfog high-pressure misting system that envelopes the space. Cooling mist keeps guests comfortable and evaporates as a dry fog so no one gets wet. No slips, no damp tableware, just pure, natural cooling. Small business owners know how important is is to attract new customers and keep them coming back. When your business is in a hot climate, it can be hard to meet these goals during the sweltering summer months. Installing a misting system is a great way to retain customers and promote more through word of mouth! Koolfog systems are customized to any environment and are always a big hit. Mumm Winery has taken advantage of all the benefits of a cooling system – why haven’t you? Contact us today to get started. Ella brings her passion for creative communication and a fresh perspective to our Koolfog team as marketing assistant. Charged with the responsibility for developing website content, blogs, and promoting our amazing cooling technology, Ella is making a difference with her attention to detail.In her “spare” time, Ella juggles her studies as a Communications major at the University of California Davis while fostering kittens, hiking, and baking.